The EU Commission adjusted its growth forecast for the Eurozone. 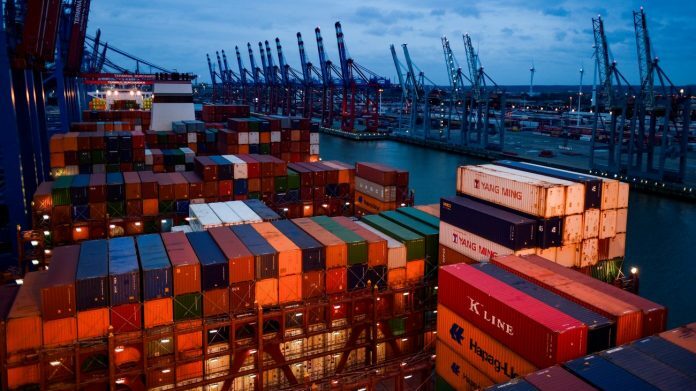 2019 gross domestic product (GDP) is expected to grow in the 19 States of 1.3 percent, said the Brussels authority. In the autumn, the Commission had forecast a growth rate of 1.9 percent. the reason for the correction and especially the lower expectations of Germany, Italy and France. The prognosis is vitiated in addition, because of international tensions and the threat of a chaotic Brexit with considerable uncertainties. “All countries of the EU will continue to grow, that means more Jobs and prosperity,” said the EU Commissioner Valdis Dombrovskis. There is, however, increasing global trade, uncertainties and problems within the individual EU member States. Social tensions and uncertainties have led to expenditure on national state already last in some States to a weaker economic performance, according to the Department. In Germany, weaker exports and lower consumption would have contributed to weaker growth. For the Federal Republic of Germany, the EU-Commission in 2019, it now expects growth of 1.1 per cent, in the autumn it was still 1.8 per cent. Particularly clear, the Commission cut its forecast for Italy. The GDP will increase, therefore, in the country in 2019 by only 0.2 percent. Previously, it was still 1.2 percent. Due to the threat of a disorderly Brexits must also set the UK on a significantly lower growth. The British Central Bank lowered its forecast for the current year from 1.7 to 1.2 percent. The prospects depend on the Bank of England, to a large extent on the nature of Britain’s withdrawal from the European Union. In Germany had adapted the Federal government’s growth forecast by the end of January. Instead of the 1.8 per cent growth now expected for the current year, only one percent.